Whilst the recent surge in Sierra Leone’s iron ore production has given much needed boost to the country’s GDP, topping the sub-regional average of 4.5% by almost 11% in 2012, the region’s economic and political powerhouse – Ghana fared much worse. 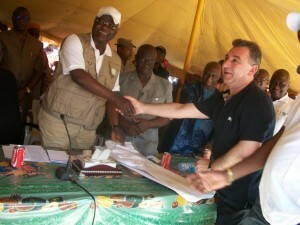 (Photo: President Koroma shaking hands with Frank Timis – owner of iron ore giant African Minerals Ltd.). Ghana’s GDP grew by only 8% in 2012, despite government’s effort at diversifying the economy, as the country’s cocoa and gold export revenue declined sharply. Similarly, the Gambia – one of the smallest countries in the region, but with one of the most effectively managed and advanced tourism sector in Africa, is also performing rather poorly, as it tries to recover from declining groundnut export sales. And as the latest reports of the IMF suggest, both the Ghanaian and the Gambian governments would need to improve on their fiscal policy management, if they are to continue to succeed in weathering the economic storm that is currently impeding economic growth. “The Gambian economy has generally performed well over the past several years, although it is still recovering from the 2011 drought. The drought led to a large drop in crop production and a sharp contraction in real Gross Domestic Production (GDP) in 2011. “Although growth has been picking up, weaknesses in the balance of payments have persisted, leading to depreciation pressures on the Gambian dalasi. Most recently, inconsistent economic policies have intensified these pressures. “Large fiscal deficits – financed mostly by domestic borrowing, have added to the government’s heavy debt burden. “Interest on debt has consumed a rising share of government resources in recent years, reaching 22½ percent of government revenues in 2012, most of which was paid on domestic debt. “As outlined in the authorities’ Programme for Accelerated Growth and Employment (PAGE) launched in December 2011, the government aims to gradually reduce the fiscal deficit and ease its heavy debt burden. “Prior to the drought, The Gambia made significant progress in the fight against poverty; however, poverty is still widespread. Execution of the PAGE, supported by commitments from development partners, would help to further reduce poverty, especially in rural areas, given a strong focus on agriculture. “The banking sector remains adequately capitalized, following a two-step increase in the minimum capital requirement implemented at end-2010 and end-2012; however, non-performing loans have remained high. “Despite near-term uncertainties, the medium-term outlook for growth is generally favourable. Real GDP growth is projected to increase slightly to 6-6½ percent in 2013, driven by a further recovery in agriculture. “Inflation has been rising, but is expected to fall back to around 5 percent a year over the medium term, as the Central Bank of The Gambia exercises monetary restraint. 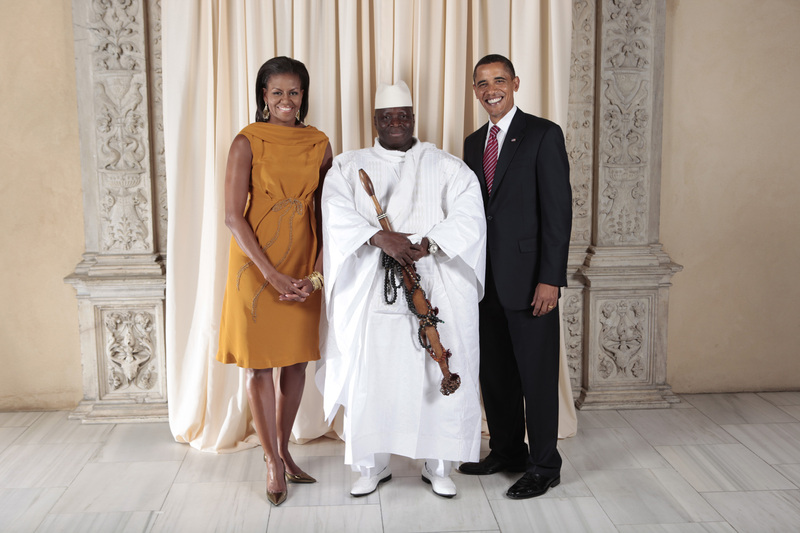 (Photo: Yaya Jammeh with the Obamas). “The main downside risk arises from possible fiscal slippages. There is also strong upside potential if critical reforms are achieved. The Executive Directors say that they “welcomed The Gambia’s ongoing economic recovery from the 2011 drought and commended the authorities for achieving robust growth and significant poverty reduction in recent years”. “However, Directors expressed concern that recent fiscal slippages and inconsistent policies have increased risks and vulnerabilities. A return to the path envisaged by the authorities’ Programme for Accelerated Growth and Employment (PAGE) is needed to regain stability and foster inclusive growth. Moving further across to the ‘Gold Coast’ – the economic narrative is almost the same. The government of President John Mahama has to do more to get the wheels of the economy turning again. “While Ghana’s medium-term economic prospects remain strong, short-term risks arise on the back of sizeable fiscal and external imbalances. Economic growth weakened in the first half of 2013, reflecting energy disruptions and high real interest rates. “As energy problems have now subsided, the mission expects full-year growth of about 7 percent, compared with 8 percent in 2012. “Inflation has risen temporarily above 11 percent, as a result of the significant fuel price adjustments earlier in the year. “The main risks to the economy arise from a large current account deficit, projected to increase to above 13 percent of GDP in response to much weaker gold and cocoa prices and ongoing fiscal pressures. “With projected reserves of less than 3 months of imports, the economy is exposed to risks from a potentially deteriorating external environment and global financial market pressures. “A preliminary assessment of fiscal performance during the first seven months of the year reveals significant challenges. Consistent with a slowdown in economic activity, revenues have fallen short of expectations, and overruns in the wage bill, electricity subsidies, and high interest payments on public debt are creating fiscal pressures. 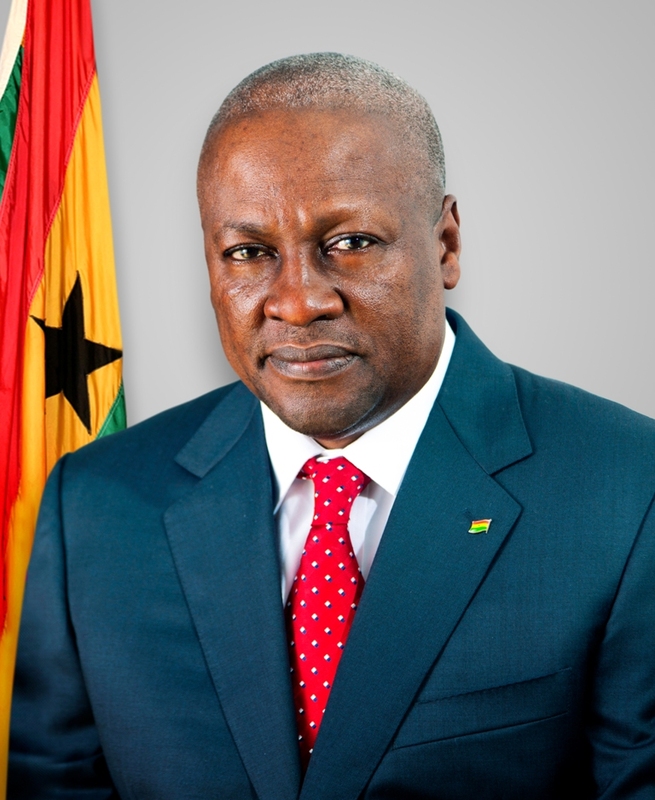 (Photo: President Mahama of Ghana). “The government has responded decisively with a sharp retrenchment in other expenditure and the mid-year adoption of revenue measures, such as the reintroduction of the national stabilization and import levies. “However, it will be difficult for the government to keep the deficit below 10 percent of GDP. “The mission welcomed the consensus that is now emerging to reduce the excessive share of wages in government spending. The biometric registration of all public sector employees, the planned introduction of new HR guidelines to control hiring, and the agreement to settle wage negotiations before the budget discussions are positive first steps. “Considering the unsustainable wage dynamics of recent years, a different approach is needed, based on wage moderation and strategic choices about the size and composition of the civil service. “The mission agreed with the authorities on the need to reduce subsidies and tackle the problems in the energy sector. It welcomed the reinstatement of the automatic fuel price adjustment mechanism. “Going forward, restoration of electricity tariffs to cost-recovery levels will reduce fiscal risks and provide the needed space for higher social spending and critical infrastructure. “To support these priorities, the mission also encouraged the government to strengthen its ongoing efforts to improve revenue collection and continue the ongoing public financial management reforms, which have gained renewed momentum. “Discussions with the Bank of Ghana focused on external risks and the challenges of bringing inflation back to single digits. The mission stressed the need for rebuilding a prudent reserve buffer. The IMF team says it will return to Ghana in early 2014 to conduct Article IV consultation discussions.